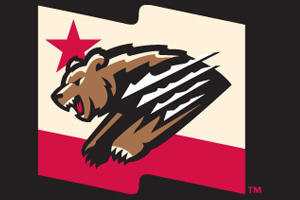 The Fresno Grizzlies' new logos honor the history of the club and the California flag. While winter rolls on, the Fresno Grizzlies are ready to emerge from hibernation with a fresh coat this spring. The Triple-A team revealed updated logos and uniforms on Tuesday night, ushering in the new era as a Nationals affiliate while building off the success of their 2015 redesign. "The bear flag became the icon that rung in a Major League affiliate change, and now this next step in our brand really takes that Growlifornia and the bear flag and gives it a new edge," Grizzlies president Derek Franks said. "It gives us a look and feel that we feel is our long-term look for the Fresno Grizzlies that we're really proud of." In-house designer Dorian Castro collaborated on the final artwork with San Diego-based design company Brandiose, aiming for that Golden State feel, from the colors to the bear and the star. Moving away from the black and orange of their Giants and Astros days, the Grizzlies will now rock red, black, beige and brown, with a touch of gold to resemble the California state flag. Franks and the Fresno staff are happy to find a unique color scheme that the city can claim as its own while also being connected to the local sports at Fresno State (and "coincidentally" with the parent club Nationals) via the red. "It's a color scheme that belongs to the Fresno Grizzlies and it's a look that you know is here for the long haul and you can get behind, regardless of who your favorite Major League team is," he said. "We feel like we got a brand that is for everybody in the community now, from top to bottom, the colors and everything. I think our fans are going to love that." When the club became an Astros affiliate in 2015, the team sought to find a common thread between Texas and California, landing on the star. Four years later, Fresno appreciates that star more than ever as a vital part of the California (and Growlifornia) flag. While the primary home and away uniforms will be similar -- both saying "Fresno" -- the home logo will feature that star. "Most teams wear the team name on the front at home, but we made the decision years ago to always wear Fresno at home as a proud tradition, so that our fans are just reminded that this is their team in Fresno," Franks said. "So we're excited to continue that and continue with some of the historic marks that have been with the club since 1998, like the F slash. So our fans are going to see some familiar marks that pay tribute to the history of the club." Because the 2015 logo featured the full team name and a large bear, leading to embroidering issues, it was not used on much merchandise or apparel. Now, with a simpler look, Franks and his staff are eager for the bear logo to finally take its rightful place on a hat. "This feels like a more modern take on the grizzly bear and I'm excited," he said. "I'm most excited about the new bear, I think, out of all of them. And of course we love having the flag. I'm really pumped about the flag logo and the fact that we have that on the cap." Perhaps the most unique part of the redesign is that at home, the Grizzlies will be wearing red pants, red belts and red socks to go with the beige and red jersey. And if the players follow Franks' wishes too, they'll be wearing red cleats. "If you look at the California flag, or the Growlifornia flag in our case, the top of the flag is white. And the bottom is red. And there's a little red strip at the bottom. So the characteristics of many of our logos have that in it," he said. "We'll be the only team in Minor League Baseball that wears red pants as a home, primary uniform. And we're very excited about that." 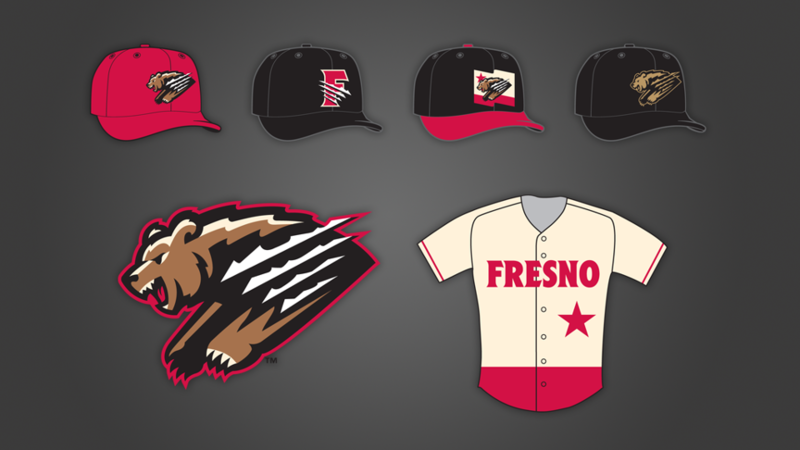 With new ownership -- the Fresno Sports and Events LLC -- and a changing landscape in Minor League Baseball that now features wacky names, the Grizzlies staff considered changing the identity completely. But after doing market research with Brandiose and talking with fans in Fresno, they decided against it. "We are the Fresno Grizzlies, and that name is strong and that identity is strong in this community. We just needed to give it a refreshed look to take us into the next era of Grizzlies baseball," Franks said. "We considered everything and learned through the process that we are the Fresno Grizzlies. Forever."